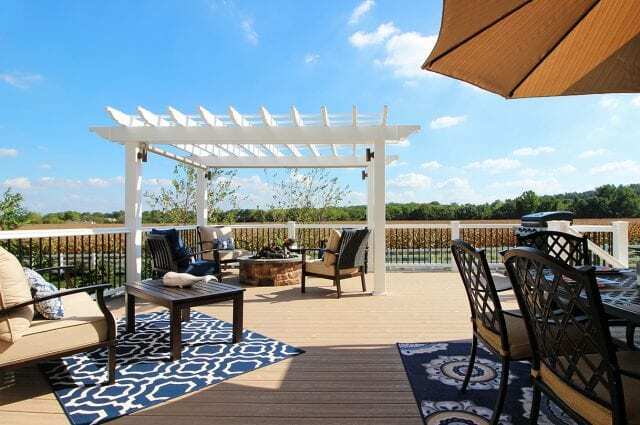 Cleaning a composite deck is easier than washing your car — and that’s just one of the reasons it’s the hottest deck material on the market. While traditional wooden decks require intensive yearly maintenance to keep them looking sharp, cleaning composite decking is easy and simple. Boasting the natural look of wood and the advantages of vinyl, composite decking material is made of a precise blend of vinyl and wood and surrounded with a vinyl coating. As a result, composite is specifically engineered to repel dirt and — that’s a large part of the reason the material is so easy to clean. Learn more about the advantages of composite decking compared to wooden decking. While cleaning composite decks is a breeze compared to wooden ones, it’s always good to have some pointers from an expert. Check out our DIY composite deck cleaning guide to keep your composite deck looking as stunning as the day it was installed. 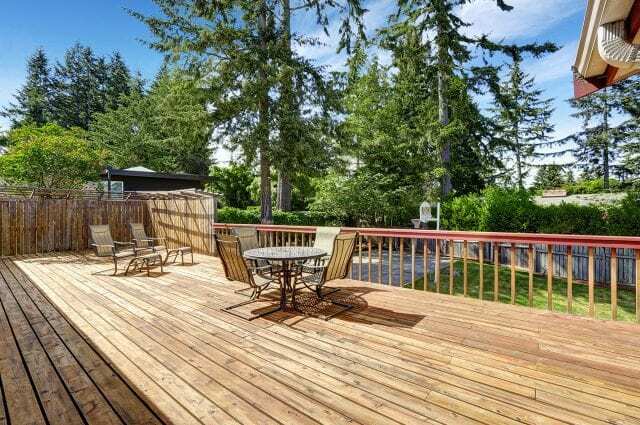 Even though composite decks resist the dirt and damage that can ruin wooden decks, they still need to be cleaned from time-to-time to look their best. 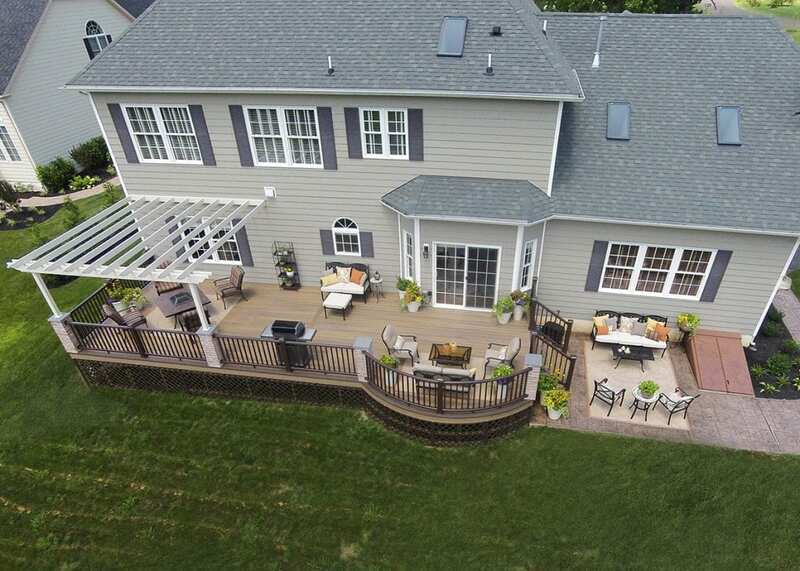 At Keystone Custom Decks, we are true composite deck experts — and here’s how we recommend handling the most common types of composite deck maintenance. Mildew & Mold — While mold and mildew OFTEN infiltrate and ruin wooden decks, it can’t do the same damage to composite. Mold and mildew do look unsightly on the surface, but it isn’t a danger. The best way to clean mold and mildew off your deck is with dish soap and warm water using a soft bristle brush. Debris — Because of the vinyl capping’s anti-microbial qualities, mildew won’t be able to grow directly on the surface. However, it can grow on backyard debris like leaves and branches, and eventually spread onto your deck. Wet leaves, in particular, are a breeding ground for mold. So, sweep your deck regularly and you should never have to worry about cleaning mold in the first place. Dirt Between Grooves — The grooves on the composite deck boards can trap dirt and grime from normal, everyday use. To keep those grooves clean, we recommend power washing your deck once a year. 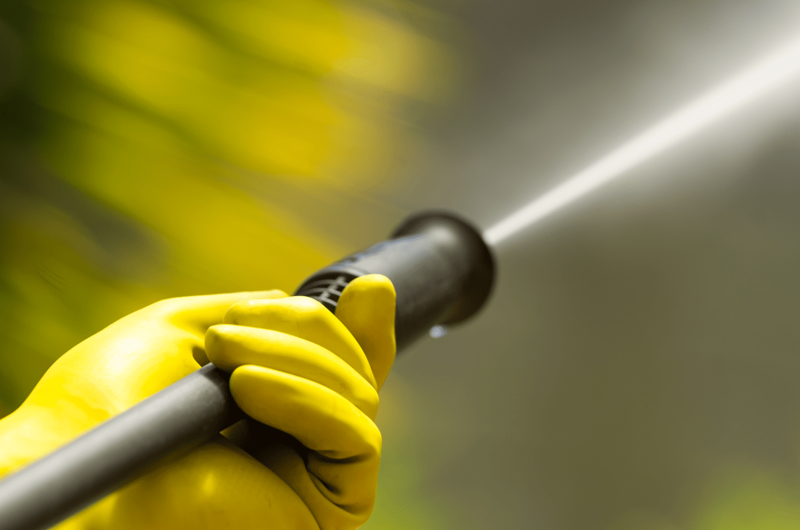 For best results, use a pressure washer with a fan-tip and no more than 3,100 PSI. This is the most intensive maintenance your composite deck will require — yet it’s still so much easier than sanding and staining a wooden deck. 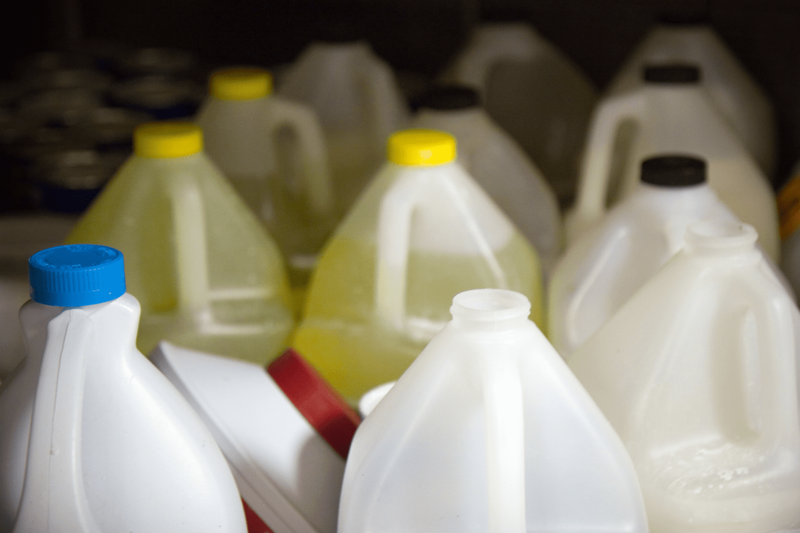 Food and Beverage Stains — The vast majority of food and drink stains (even the dreaded red wine stains) can be wiped away with a dry paper towel. However, if you have a particularly tenacious stain, simple soap and water will do the trick. While this would be a permanent stain on wooden decking, cleaning composite decks is just that easy and effective. Pollens — Depending on where you live, every spring you might have to deal with a thin coating of pollen on EVERYTHING. If you notice a buildup of pollen on your deck, don’t worry it can’t cause any long-term damage. If you want to get rid of the pollen, power washing it will do the trick — and do it quickly too. Snow & Ice — Clearing snow and ice off your deck sounds like it should be easy, but you need to be careful. A metal or metal-edged shovel can permanently cut, chip or damage your composite deck. Instead, use a plastic shovel, and you’ll be all good. Plus, rock salt is perfectly safe to use on your composite deck to help melt ice after a storm. While cleaning composite decks is extremely easy, there are some things you just shouldn’t do. Using cleaners made with harsh chemicals can actually damage the deck boards themselves. For example, cleaning composite decking with bleach is absolutely NOT recommended and can leave permanently discolored spots. Bottom line: cleaning composite decks is easy — and you won’t need to use heavy-duty chemicals. There’s no doubt that the easy maintenance of composite is a selling point, but the real reason to go composite is just how downright gorgeous it looks — see our jaw-dropping project gallery. 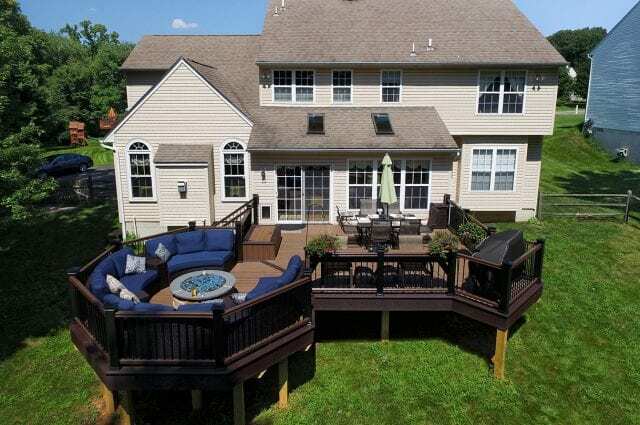 If you want to enhance your home with a composite deck, we’re the team to do it. Start the conversation about your dream outdoor space today. Thank you for a first rate job. We are very happy with the deck!